I've been searching for a reclaimed wooden crate bed for my pups for a while now and as it turns out, it's being made just across the Georgia border. Artist, Kevin Mulrooney of Birmingham, Alabama has been working with reclaimed wood for years- and has created some impressive pieces to show for it. I can see this chalkboard crate working just as well on a General Store shelf as it would atop your office desk or to organize a kid's room. And this wine crate has a worn, stylish cool that makes it work for any myriad of uses, from storage to display. I think my favorite piece of Kevin's is this side table that he handcrafted from old barn wood- an old Alabama horse barn to be exact. 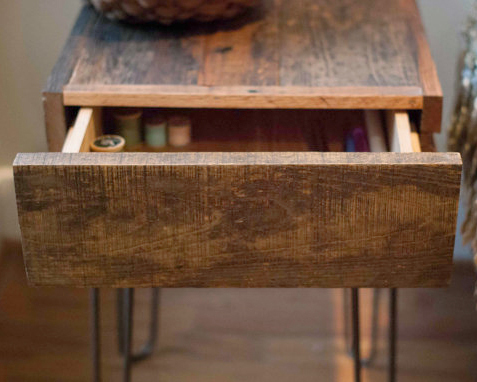 It has steel hairpin legs with a gray/silver patina that complements the worn wood quite beautifully.